The Trinidadian made this revelation on Sunday at King City where the inaugural Global T20 Canada culminated with Vancouver Knights ruling supremacy. Among the six teams participated was a Cricket West Indies ‘B’ side and to the delight of many West Indian enthusiasts, they made a great impact by featuring in the championship encounter. Prior to that engagement, Cricket West Indies ‘B’ roared to four consecutive victories before they were humbled by the tournament’s winner at their final preliminary round match, but quickly rebounded to beat the same opponents in the first playoff match and subsequently booked a place in the final. “The performances I have seen, I impressed with them and [am] always believe that the Caribbean have produced great talents; this is a young team, a third rank side because you have the senior boys playing against Bangladesh and then a ‘A’ team in England, so they are talented enough to be that good here,” Lara asserted. In the final, Cricket West Indies ‘B’ only managed an insufficient 145 all out while Vancouver Knights, in reply, cantered home losing only three wickets in the process with 15 balls to spare. The ex-West Indies skipper mentioned that Cricket West Indies must work with these talents that they have around the region. “We never lacking in talent but how we bridge the gap between first-class and international cricket that is the problem, there is where we are putting ourselves down….we have to find ways to nurture these young talents; we have to get an engine room to do it as well,” Lara, still with the distinction of making the highest individual test score, 400 not out, related. 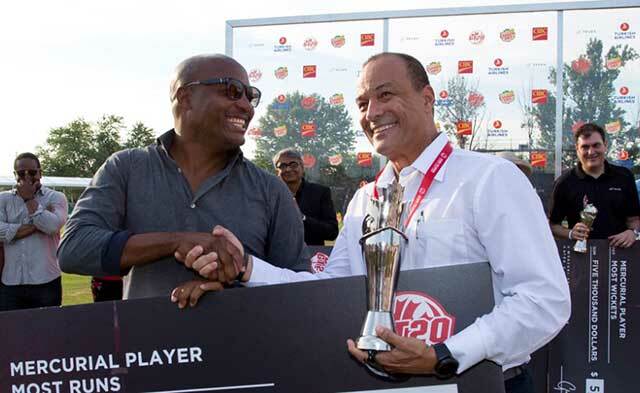 At the introduction of the tournament in June 28, Lara had appealed on the game’s lovers to support the 18-day Global T20 tournament which attracted a galaxy of T20 star players from around the planet having been the Brand Ambassador. In additional to Vancouver Knights and Cricket West Indies ‘B’, the other teams were Montreal Tigers, Edmonton Royals, Toronto Nationals and Winnipeg Hawks. Some of the players made headlines for the Cricket West Indies ‘B’ were Sherfane Rutherford, who cracked the tournament’s lone century, an unbeaten 134 also against Knights, while Justin Greaves scored 89 not out. Batsman Nicolas Pooran and Brandon King displayed consistency while Fabien Allen, Kavem Hodge and Shamar Springer churned out good all-round performances. Pacers Obed McCoy and Darval Green were outstanding with the ball among others as well.